2011 is the eleventh year that Tails of the Tundra Siberian Husky Rescue (TOTTSHR) has been in operation. To date we have had the opportunity to help over 750 dogs find their way into loving homes. We love watching our list of success stories grow. Keep checking in as the year progresses to read about the new faces that are moved to these success story pages. Remember that if you'd like to help move one of our dogs from "available for adoption" to "success stories," go to our Available pages and start searching for that special dog. 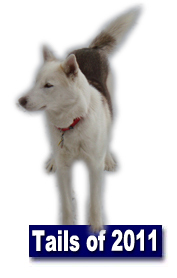 2010 is the tenth year that Tails of the Tundra Siberian Husky Rescue (TOTTSHR) has been in operation. To date we have had the opportunity to help over 700 dogs find their way into loving homes. 2009 is the ninth year that Tails of the Tundra Siberian Husky Rescue (TOTTSHR) has been in operation. To date we have had the opportunity to help over 650 dogs find their way into loving homes. 2008 is the eighth year that Tails of the Tundra Siberian Husky Rescue (TOTTSHR) has been in operation. To date we have had the opportunity to help over 600 dogs find their way into loving homes. 2007 is the seventh year that Tails of the Tundra Siberian Husky Rescue (TOTTSHR) has been in operation. To date we have had the opportunity to help over 560 dogs find their way into loving homes. 2006 is the sixth year that Tails of the Tundra Siberian Husky Rescue (TOTTSHR) has been in operation. To date we have had the opportunity to help over 500 dogs find their way into loving homes. 2005 is the sixth year that Tails of the Tundra Siberian Husky Rescue (TOTTSHR) has been in operation. To date we have had the opportunity to help over 500 dogs find their way into loving homes. 2004 is the fifth year that Tails of the Tundra Siberian Husky Rescue (TOTTSHR) has been in operation. To date we have had the opportunity to help over 300 dogs find their way into loving homes. We rang in the new year this year by satisfying that incredible urge for potato chips—on January 10, Umali and Voodoo chose the same family and convinced that family that they shouldn't have just one Siberian! The following day, two more dogs found homes and we can only hope that this trend continues throughout the year. We love watching our list of success stories grow. 2003 is the fourth year that Tails of the Tundra Siberian Husky Rescue (TOTTSHR) has been in operation. Since the inception of the rescue we have had the opportunity and pleasure to help over 350 dogs find their way into loving homes. We can't thank everyone who has helped in our rescue rescue efforts enough. The only way we could even begin to thank is to show you the results of your efforts with success stories like these. Keep checking in as the year progresses, as new faces are moved from available to our success stories. Please remember if you have adopted a dog from us, please feel free to send us your updates on your dogs. We love photographs too! In there pages you will have a chance to read about special dogs such as Bartles who is our 2003 poster dog. Also dogs like Imoya...Imoya was only 3 years old when she came into rescue. With the sweetest brown eyes that stole our hearts and such a loving disposition that you couldn't help but fall in love with her. Remember that if you'd like to help move one of our dogs from available for adoption to success stories, simply go to our available for adoption pages and start searching for that special dog. You can also help rescue many ways, adoption and fostering isn't the only way to help. Check out our Help Us pages to find out more about things such as our online store, ebay auctions, and volunteering too! This is the third year (2002) that Tails of the Tundra Siberian Husky Rescue (TOTTSHR) has been in operation. To date we have had the opportunity to help over 180 dogs find their way into loving homes. We can't thank everyone who has helped in our rescue rescue efforts enough. The only way we could even begin to thank is to show you the results of your efforts with success stories like these. The year certainly started off on the right paw, when Simba (one of our special needs dogs) went to his new home on January 5th, 2002. Simba's story began long before rescue took him into care. His previous owner's turned him in to the shelter when he was only two years old. The reason they gave was that they were moving and their new home said "no dog's allowed." Rescue learned that there may have been much more to his past. Shortly after arriving in rescue he was tested positive for heartworm. In addition, his leg which he so tenderly used was once hit by a car. The rescue utilized the Toby Fund to help sweet Simba out of his despair. Meanwhile, a loving family for Simba was just around the corner. While he was busy getting back on all four paws, Lori and Tim were checking him out on the website and falling in love with him. And so it was that our first adoption of the year was a sweet success for everyone. Simba is featured on our Toby's Friends Success Pages. Be sure to stop by and check out the movie his family sent of him using his leg! On those pages you can read more about Simba and other dog's who needed special medical care, the vet's who helped them and the families who now love them. Keep checking in, as we are always receiving updates on our husky friends. It's always a pleasure to see how well they are doing in their new homes. Smiling husky faces, their new antics, and much more. To date we have received some antics caught on film including, Reagan's (formerly Buster) new table bed, Jetson's new clothes, Galileo (now Frodo) getting a bath and we can't forget sweet China's family portrait! These are some of our success stories from the year 2001. There were so many wonderful dogs that came into our care. We hated to see them go, but each foster home knew that it was so that they could make room for the next sweet soul that needed a place to stay. In 2001, Tails of the Tundra successfully placed over 75 dogs into loving homes. Many thanks to places like Petfinder.org and the National Rescue Website to name a few, that helped to publicize these dogs and match them to their new families. We also had great success in helping these boys and girls find homes at the meet and greets we attended, including Oktoberfest in Doylestown PA, the New Jersey Super Pet Expo, and Super Sunder in Media PA. To learn more about our meet and greets and some of our featured past events, visit our Meet and Greet webpages. Some of these dogs wouldn't have had a chance without the efforts of some of the shelters that work with us. To all of our shelter friends, thank you again for helping to save these sweet dogs and working with Tails of the Tundra. Throughout these pages you can learn more about the happy tails of 2001, including Blazer. A special pure white husky who not only found his home, but helped to convince his family that they should help other huskies in need. Soon after taking hold of the hearts of his new family, he began to woo them into joining rescue. Blazer is just one of many special dogs that helped saved other huskies. Who knows, you could be next? We hope you enjoy reading and viewing the stories of 2001. Don't forget to check in often as their new families love to send us stories as much as we love reading them. And if you are just checking in on your story... don't forget to listen to the woo's of your furry-friend. They could be telling you to join the rescue! If you get that woo, be sure to stop by our How You Can Help pages, to learn more about how you can help. It was a very exciting year for Tails of the Tundra Siberian Husky Rescue (TOTTSHR) and its extended human and canine family. We were founded in May 2000 and in that year over 35 Siberian Husky and Siberian Husky mixes found a "new leash on life" and are now happily sharing their practical jokes, woo-woo's, and escapades with their new families. Our first success story started with a sweet girl named Kita. Her owner had become ill and was no longer able to care for her. With nowhere to turn, they surrendered her to the local shelter. She came into rescue at the age of 7 1/2 years old on April 28th, 2000. A perfect angel waiting for her perfect home, we knew it wouldn't be long before she would find her forever home. And so it was, that on May 6th, Dinah gladly welcomed Kita into her heart and home. We'd like to thank all of you who made it possible to give our rescued dogs a second chance at life - the shelter staff who kept the dogs healthy and safe until we could bring them into our rescue organization; the foster families who opened their homes and hearts for temporary housing; the veterinarians who provided expert care for each dog before placement; the volunteers who tirelessly help in transporting dogs, education the public, and raising funds; our adoptive families who are sharing their lives with their new friends; and all or our friends who kindly donated their time and money to help us continue this important work and made this first year a great success. Featured along the right side of this page are some of the dogs that found their way home in 2000. Just click on a dog's name to learn about their story and see pictures of that happy husky. Keep checking in as we often receive updates from their homes. We hope you enjoy seeing how well these special canines are adjusting to their forever homes as much as we do!